On the eve of the World Hepatitis Summit in Sao Paolo, the international medical humanitarian organization Médecins Sans Frontières (MSF) today announced that it had secured deals for generic hepatitis C medicines for as low as US$1.40 per day, or $120 per 12-week treatment course for the two key medicines sofosbuvir and daclatasvir. In the US, pharmaceutical corporation Gilead launched sofosbuvir at $1,000 per pill in 2013, and Bristol-Myers Squibb (BMS) launched daclatasvir at $750 per pill in 2015, leading to the original price tag of $147,000 for a person’s 12-week combination treatment course. The corporations have also been charging exorbitant prices in many developing countries, paralyzing the launch of national treatment programs and causing treatment rationing in many countries around the world. In 2015, MSF started procuring sofosbuvir and daclatasvir from Gilead and BMS through their ‘access programs’ at a price of $1,400 to $1,800 per 12-week treatment. Today, MSF pays a fraction of that, at $120, sourced from quality-assured generic manufacturers. An estimated 71 million people have chronic hepatitis C infection worldwide, 72 per cent of whom live in low- and middle-income countries. Direct-acting antiviral medicines (DAAs) represent a treatment breakthrough for people with hepatitis C, with cure rates of up to 95%, and with far fewer side effects than previous treatments. Yet access to DAAs has remained limited because pharmaceutical corporations charge unaffordable prices, leading many countries to reserve treatment only for people with the most advanced stages of the disease. By the end of 2016, three years after sofosbuvir was launched, only an estimated 2.1 million people globally had been treated with the medicines, leaving 69 million people still without access. These high prices have also put a major strain on health systems in wealthy countries, in particular those enacting universal health care. Treatment is being rationed in countries such as Australia, Canada, Italy and the US, in addition to developing countries, and is a stark reminder of the early days of HIV treatment. 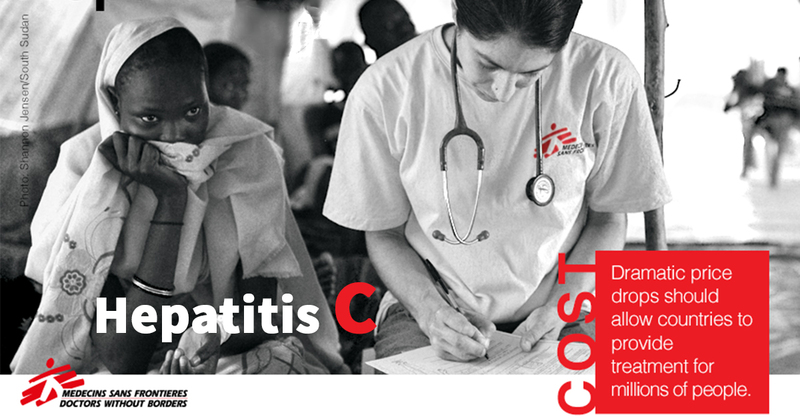 MSF treats people with hepatitis C in 11 countries. Since 2015, MSF has provided DAA treatment to nearly 5,000 people with hepatitis C. Of those who have completed treatment to date, the overall cure rate – measured by ‘sustained viral response’ – is 94.9 per cent.